Should MGM Resorts Be Paying a Dividend? The casino operator makes enough money each year to start paying investors a sizable dividend. Should it loosen the purse strings? Dividends were once a rarity in the casino business. Expansion was so fast, and so expensive, that for decades MGM Resorts (NYSE:MGM), Caesars Entertainment (NASDAQ:CZR), and Steve Wynn's companies like today's Wynn Resorts (NASDAQ:WYNN) didn't pay a dividend. Even Sheldon Adelson's relatively young Las Vegas Sands (NYSE:LVS) was busy spending billions to expand from the time it went public until a few years ago. But something has changed in the last three or four years. Gaming companies are now generating so much cash and have so few options for expansion that they have excess cash on the balance sheet. Wynn Resorts and Las Vegas Sands are using that to pay a regular dividend, so why isn't MGM Resorts? One of the reasons gaming companies haven't typically paid dividends is that they've been loaded with debt. It's debt that fueled construction of the Las Vegas Strip we know today and Macau as well. 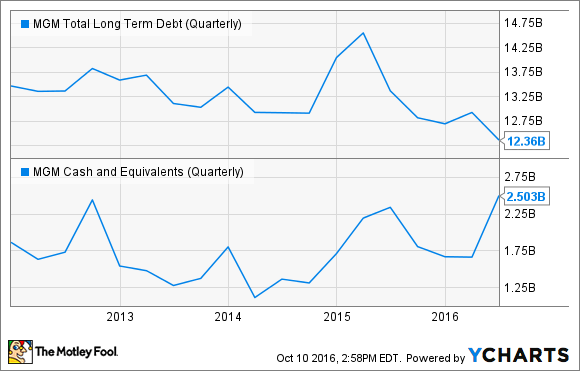 But debt loads are starting to become far more manageable, even for MGM Resorts. In the last 12 months, MGM has generated $2.5 billion in EBITDA, a proxy for cash flow from a gaming company, compared to $10 billion in net debt on the balance sheet. That's a very reasonable net-debt-to-EBITDA ratio of 4.0. MGM Total Long Term Debt (Quarterly) data by YCharts. If this continues, MGM will continue to de-leverage the balance sheet, which is one option. But once MGM Cotai is completed -- which is part of MGM China, a separate subsidiary 51% owned by MGM Resorts -- it doesn't have any major expansion plans on the horizon. There aren't open spaces in Las Vegas waiting to be developed or locations the Macau government would allow to be developed. It will just be generating cash year after year from resorts that already exist. And a good use of that cash would be paying a dividend. How big could MGM's dividend be? Let's assume that MGM Resorts doesn't want to pay all of its EBITDA out as a dividend. It needs some money for improving existing properties and paying for the interest and taxes that are pulled out of EBITDA. But it could very conceivably afford to pay $1 billion per year as a dividend. That would be a 6.6% dividend yield for shareholders at today's price. That's a higher yield than Las Vegas Sands at 4.9% and 2.1% at Wynn Resorts. Caesars Entertainment, whose biggest subsidiary is in bankruptcy, is still years away from a dividend, if it ever pays one at all. Given the improvement in gaming in the U.S. and the cash coming from gaming in Macau, I think MGM Resorts has enough capacity to pay investors a significant dividend. Now investors have to demand that management does so.